This is a blog about the amazing dandy trailer tent. I aquired one of these beauties at short notice last year – the intention being to utilise it for the festival season, and then sell it on. As I am sure many owners will tell you, quiring one of these folding campers is easy but getting rid of them is a whole different matter! The Dandy is a sort of cross between a trailer tent and a caravan. It is easier to tow than a caravan and more wind & rain proof than a trailer tent. They look like a trailer tent but are made out of a PVC fabric and have some solid walls with a door in. The PVC used in the consturction of the tent section is one of the unique features of a Dandy. This PVC makes a great deal of difference to the unit, it’s wind proof, rain proof and doesn’t rot if you pack it down wet, additionally it means that the camper now has a very long life, the base can give out before the “tent” part. The inside of the old units was very simple but many are in use today with out major refurbishment. Would like more on dimesions and weights. Good Day, I was wondering if these can be bought in the United States? I’ve done some looking but not sure what to look for, can you help? That’s an interesting site for a Dandy owner. I have the only one registered in Germany. It’s a ’82 4-5 that I bought in the Netherlands in 2006. It underwent nearly a complete rework in 2007 with some modifications that made it a somewhat special Dandy ;-). I wondered if anyone can help us. We have a Dandy 4/5 berth, late 70’s/early 80’s and the door lock is broken. We would like to replace it if we can and need a point in the right direction on where to look. Hi, can someone tell me the weight of the PVC fabric used on a Dandy i.e. 550 gsm? Hi, I am looking to buy a 4+ berth dandy for family holidays. is anyone willing to sell one? I am on a small budget! thanks. please reply to sazt@yahoo.com. hello, im looking for a dandy dart (the smallest of them all ) . if anyone has one for sale it dose’nt have to be in A1condition just sound. please contact me at, theoaf1@btinternet.com. I am looking for replacement rear light glass for dart dandy trailer tent . I have just aquired a 4-5 from a good friend, its in fairly good nick except the front steel work by the towing A frame, that is riveted on and has the leg hangers mounted too, i wondered what is the best way to replace this? Is the floor screwed to it? or is it simply a case of drilling the rivets out and replacing the box section?? secondly, the orignal cover has gone stiff, what is the best product to retreat it with?? 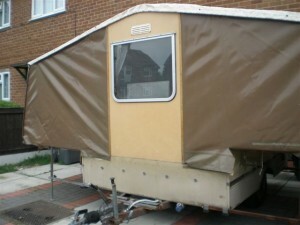 Why is the dandy not made anymore as they are so good as trailer tents?? Is there any other manufacturer that makes trailer tents out of PVC? How to put up a Dandy?